Scientists in China have developed a fabric that cleans itself of stains and bacteria when exposed to ordinary sunlight. The scientists, Deyong Wu and Mingce Long, note that there are other self cleaning products already being developed but those use ultraviolet rays to self clean (see video). Their fabric uses ordinary sunlight. Wu is from the School of Chemical and Environmental Engineering, Hubei University for Nationalities and Long is from the School of Environmental Science and Engineering, Shanghai Jiao Tong University. The material uses a coating from a compound of titanium dioxide (TiO2). It is a cheap, nontoxic, highly efficient, stable, and ecologically friendly photocatalyst. This compound has been proved to be an excellent catalyst in the degradation of organic pollutants. It won't be long until jeans, socks and other forms of clothing will be available that cleans and de-odorizes themselves when hung on a clothesline in the sun or draped on a balcony railing. In chemical terms, photocatalysis is the acceleration of a photoreaction in the presence of a catalyst. In this case, sunlight triggers the self cleaning process of the fabric. TiO2 is already being used in self-cleaning windows, kitchen and bathroom tiles, odor-free socks and other products. It has also various uses in white paint, food, and sunscreen lotions. The compound breaks down dirt and kills microbes when exposed to some types of light. Their science report describes cotton fabric coated with nanoparticles made from a compound of titanium dioxide and nitrogen. 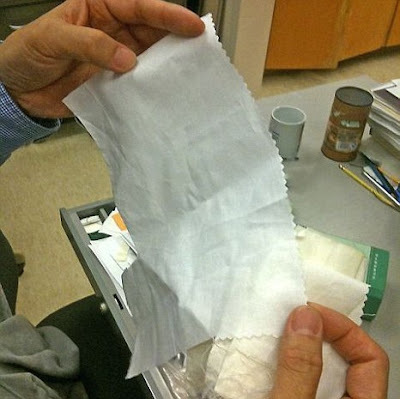 They show that fabric coated with the material removes an orange dye stain when exposed to sunlight. Further dispersing nanoparticles composed of silver and iodine accelerates the discoloration process. The coating remains intact after washing and drying. The authors acknowledge funding from Donghua University and the National Natural Science Foundation of China.